You get a new cell phone and start using its messaging system. You enter sentences when you text your friends, and eventually see the cell phone starts suggesting words or guessing what you are going to type. The more you use the phone, the better its guesses will be. 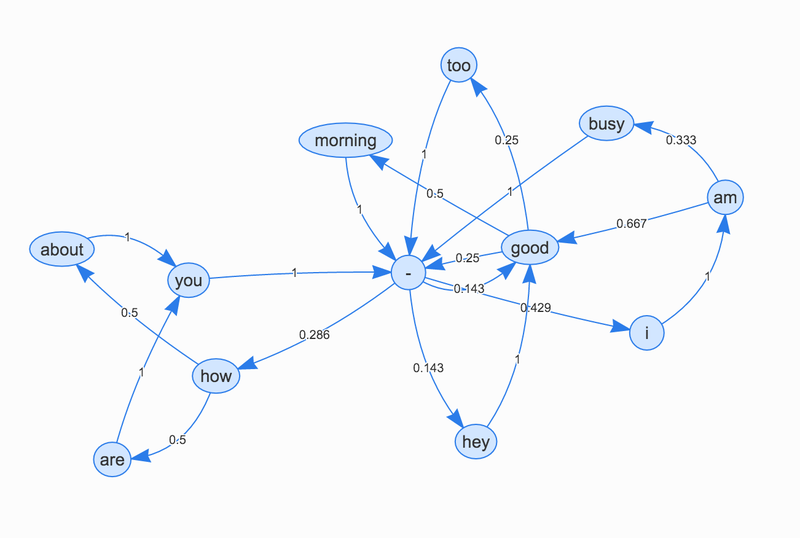 Let's see how we can build a simple Bayesian Network based on the sentences you've already texted to guess the next word you are typing. 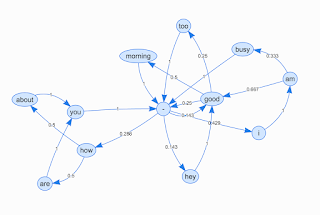 Consider the following simple sentences, and suppose you've entered them before and now we want to see how the phone can build a Bayesian Network to predict your next word. We chose just these small number of short sentences because we want to have a simple graph for our network, something understandable. 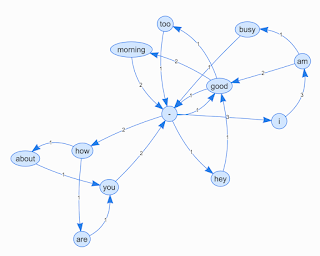 All we need to do is to have every word as a node of the graph and connect the words in order of their appearance in sentences. Score a connection as one whenever you see one for the first time or increase the score if it is already there. 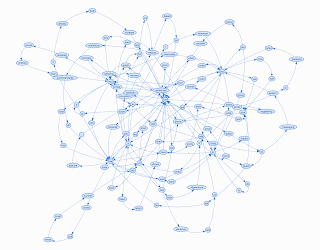 Now if you show all of these nodes and edges with their scores on a network graph, you will have the following. 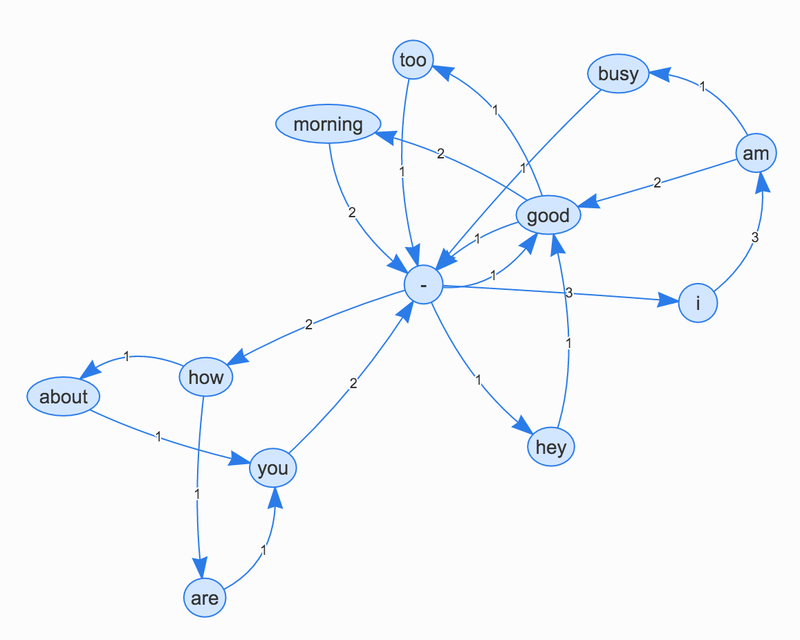 This model is in fact like the way a human baby starts learning to speak; he/she doesn't know any grammar rules but soon he/she learns by listening how other people use words. 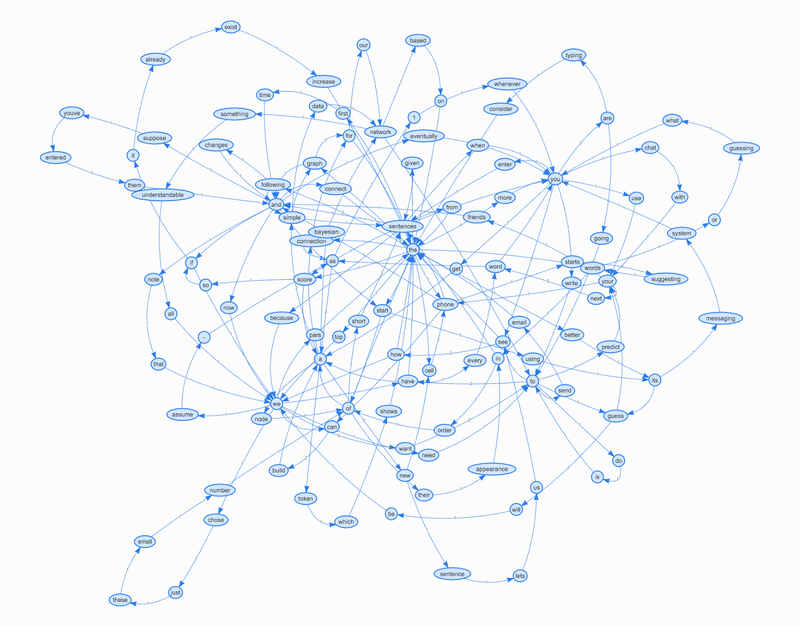 The following network shows the graph interpretation of some part of this post. And as you see the density of edges for some nodes are more, in another word they have more in/out connections than others like "the", "and", "we" ... these are the words I've used in this document more than the others. 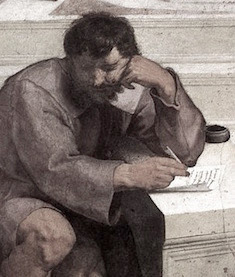 But generally, if you draw a network of my posts since my vocabulary is limited you can easily predict my next word based on the current word. we have in this post. Here we need to mention an important thing, the networks we had in this post were all based on just the previous word while we can have a better prediction if we build a network which shows the next word based on the two latest words. We will see later how we can do this too.